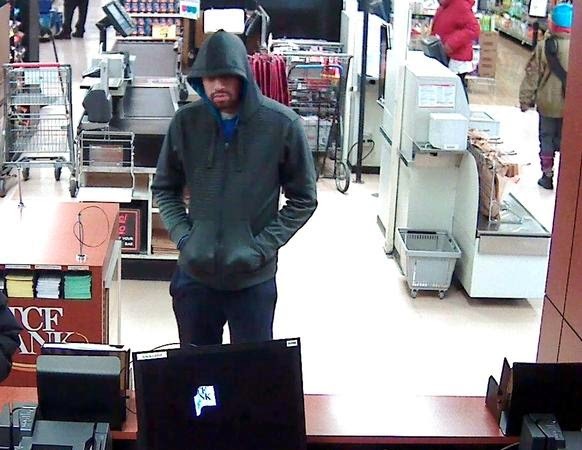 A man who robbed the TCF Bank inside of Boystown's Jewel-Osco store on Sunday struck again at a different location this morning. A hold-up alarm sounded at the TCF Bank inside of the Jewel-Osco at 4355 N. Sheridan Road shortly after 9 o'clock this morning. Officers say the man passed a hold-up note and got away with approximately $1100 in large bills. No weapon was displayed. 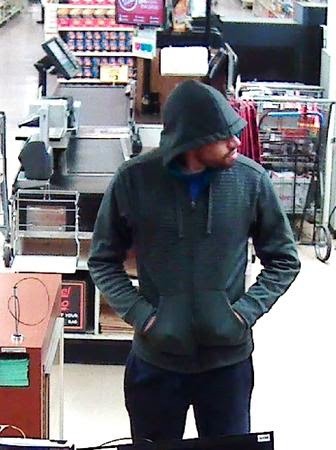 Witnesses today described the offender as Middle Eastern, 5'11" tall, 180 pounds, wearing a "very dark blue" hoodie. and gray Dickie pants. He was carrying a red book bag or backpack with gray straps. These images are from Sunday's hold-up in which the offender was described as Hispanic, however the FBI has connected the same man to both robberies. TCF Banks inside of North Side Jewel-Osco stores now appear to be the targets of choice for two serial bank robbers. A woman, dubbed the "Shady Bandit" by police, is suspected in five such hold-ups over the past year, including two strikes in Boystown. Today's hold-up is recorded in CPD case #HX193083.